Posted on 18. Dec, 2010 by Corey in All, Atlanta. Going to the movies for me has become a passion and a hobby. Everyone likes to spend their time and money at different places doing different things, but lately kicking back at a movie theater has been great for me. The selection of what to see is not that difficult, as I usually see everything eventually on DVD. The other night I headed to an opening night show of Black Swan, staring Natalie Portman and Meg Griffin, I mean Mila Kunis. The movie was out on a limited release this early, so my selection of theaters to see it in was very limited. Not to harp on it, but the AMC at Phipps Plaza in Atlanta is nowhere near my top choices of venues. Upon entering the packed theater to see the film, I was handed a small yellow card from Cinema Score. 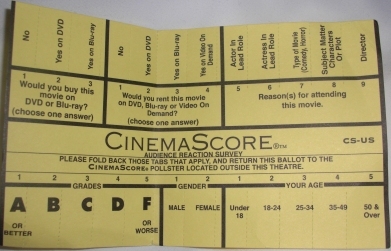 It was an audience reaction survey to the flick that they were trying to get people to fill out and return when leaving the movie. This was definitely a first for me and has never been asked such a thing. A few times over my years, mainly in college, I was given passes to sneak previews and early screenings of films. Not even there was I asked my opinion of a movie. The yellow card was simple, asking if I would buy or rent the movie when it came out. Cinema Score also asked my reason for attending the movie and then wanted a letter grade of A-F. The final two questions were basic demographic wanting to know age and gender. In case you were wondering, I would give Black Swan an A and really enjoyed this film. I NEVER read reviews before I watch a movie so that I never have any expectations. If my budget allows me to, I would like to own this movie in my collection when it comes out. I am very interested to see if this is a growing trend to ask for audience reviews following a movie at the theatre or if I was just in the right place at the right time.